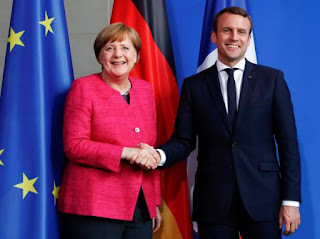 EU Prophecy News: European Defense Fund: "The Devil is in the Detail"
European Defense Fund: "The Devil is in the Detail"
This is my second post on the new European Defence Fund. There were already three 666 connections to it, that were fairly "loud." Now there is a fourth (scroll to the bottom of the link.) Since "666" is usually attached to Solana or a prophecy he fulfills, I think the governance of the future EU defence fund could potentially be very significant. Before I dive into that, I would like to summarize some major military unification steps the EU has been taking. Since the revived Roman Empire, led by the Antichrist, engages in several wars, it is required for the EU to have a military capacity for him to use. If you are new to this website, you would benefit from the video or the text overview, which would provide context to this blog post. According to EU figures, these new defence plans are "historic." They claim that in the last few months there has been more progress than in the last few decades. 1) Battlegroups - EU member countries take turns providing a deployable "battlegroup" force of 1500 soldiers. Even though this program has existed for 10 years, they have never been deployed. 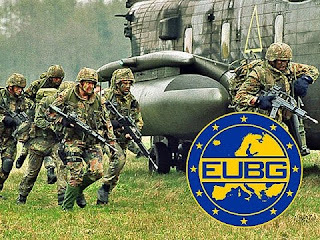 The EU plans to reform how and when the battlegroups are deployed, and reform how they are paid for so they can be deployed more often. 2) Military Headquarters - the EU now has a headquarters for non-lethal military operations. The reason it is not the headquarters for all operations is because the UK objected. It would be very easy to turn this into a full blown headquarters once the UK leaves or cave in. 3) PESCO - is kind of a "defence eurozone." Basically, it gives a core group of member states the option to move forward in the area of military unification, without worrying about others holding them back. It primarily relates to commitments in the development of military capabilities, and the ability to provide troops providing the EU goes on a special mission. 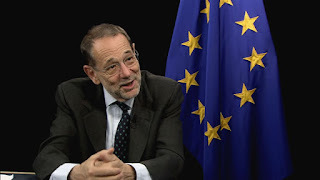 Both Solana and the EU parliament think that PESCO is a new institution, which means of course, it has the potential to become a big bureaucracy that would need a leader....EU leaders have given themselves 3 months from the end of June to come up with criteria for PESCO membership. The European Defence Fund is going to be led by a "Coordinating Board." This board will decide which defense capability projects to fund. Although member states have agreed to the EDF in principle, it is not yet into EU law, which will probably take place in early 2018, once it passes Council and Parliament. The thought is the first projects could start in early 2019 once this gets approved. As regards governance, the Commission will be responsible for the execution and the management structure of the programme. On the basis of the priorities identified by Member States, the Commission will draw up work programmes in close cooperation with the Member States (Programme Committee) and after consultation of the defence industry (Advisory Board). The work programme will form the basis for a call for proposals. Following the evaluation of proposals, the Commission will approve the list of selected cooperative projects in close cooperation with the Programme Committee. The Commission will consider delegating tasks related to the implementation of the work programme to the European Defence Agency (EDA). The Agency will also play a key role in identification of defence capability priorities commonly defined by Member States through the Capability Development Plan. The EEAS will be involved in the programme including in the work of its Programme Committee. As regards governance, the Commission will be responsible for the overall execution of the programme. It may however entrust certain tasks to an implementing body. The EDA will have a key role to play in the identification of the capability priorities, as well as in harmonisation of technical requirements. It will participate as observer in the Programme Committee composed of Member State representatives as well as in an advisory group composed of representatives of industry and other experts in the defence sector. Furthermore, the EEAS will be involved in the programme including in the work of the Programme Committee in accordance with applicable rules. Committee The Programme Committee will provide an opinion on the annual work programme and the award of funding for selected cooperative actions to the Commission. So this board that makes all the decisions on what gets funding is a mish mash of member state representatives, people from the defense industry, and "other experts in the defence sector." One major difference between PESCO and the European Defence Fund is the latter is much more specific. One analyst even stated that the governance structure of the EDF could be a conceivable model of PESCO governance. Both involve military capability development and have a decision making structure associated with them. The EU High Representative said that, ideally, the EDF would be used to fund PESCO projects. If the EDF will already have it's own leadership structure, and has strong connections to the number 666, we might wonder why they would duplicate a decision making structure within PESCO. Why not use the EDF coordinating board for that instead? After all, both of them relate to capability development and spending. (PESCO is indeed more vague and carries more possibility with it, but you get the picture). Why duplicate a decision-making structure? Leading Antichrist candidate, Javier Solana, has long been a huge advocate of boosting military capability, through finances or otherwise. When the EDF was announced, he took a surprisingly critical view of it, saying it didn't spend nearly enough. 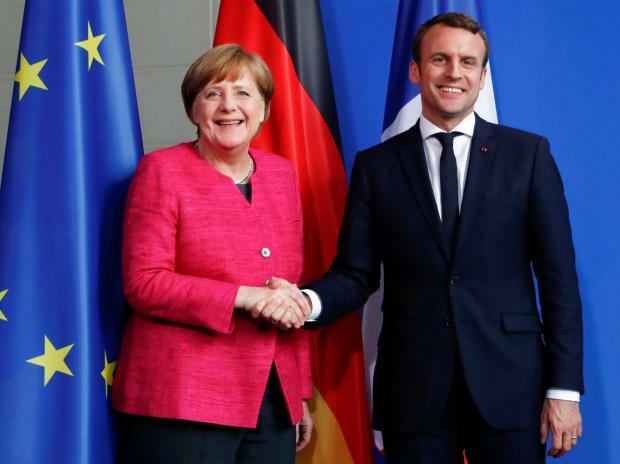 He said the "devil is in the detail," stating that though these EU defence plans are all about capability, they don't deal with the political details of what organization will be in charge. The cautious diplomatic wording used in the winter package is still useful, it seems, to paper over differences among EU member states. Yet, as always, the devil is in the detail. First, the reference to “permanent structured cooperation” (i.e. the treaty mechanism allowing a core group of member states to integrate further) is a placeholder: the current proposals are all about capabilities, without dealing with the institutional consequences. Solana believes that PESCO should be a new institution. Though long been an advocate of EU defense capability development, he states that the "Winter Package" on defence dodges the issue of how and who will run this defence fund. "EU comitology" is the term for how the Commission proposes EU law through its committee procedure. Here they are saying the governance of the fund will have to be a lot different than the way the EU currently proposes laws. Here is a thinktank article from back in March, which discusses some ways that the EDF could be run. Regarding the "capability window" (right side in picture above) it remarks on how vague the "umbrella structure" will be, and how the governance has yet to be defined. The communication from Commission to parliament and the chart it contains may add some clarity to this, though not much. The EDAP foresees such a mixed governance model (see figure 1). The ‘research window’, which is linked to the next Research Framework Programme 2021-2027, is governed through the usual comitology procedures. The ‘capability window’ is designated by the EDAP to be governed by an ‘umbrella structure’ of which the specificities are still very unclear. A second level of projects to develop joint capabilities – in which participating member states decide on the financial and operational decision-making – abides by the rules agreed at the umbrella structure. Furthermore, it complains that the "back office" part of the umbrella structure unnecessarily duplicates the European Defence Agency. The article continues, stating that the decision-making structure will ultimately be agreed by member states. Granted, this think tank analysis was prior to the June European Council this year. So they may have more details hashed out, but I don't seem to be able to find any. Who Will Chair the European Defence Fund? The think tank analysis proposes that the Commission chairs the EDF, either by having the high representative chair it or the "relevant commissioner." Who is the relevant commissioner? One can only speculate. It might be Vice President Katainen, who also presented to Parliament, together with the High Representative, regarding the new European Defence Fund. However, his portfolio is "Jobs Competitiveness and Growth," which is not particularly related to defense. One could have the security commissioner chair this. The fact is, no one really knows or has decided (yet) who the relevant commissioner will be, or who will chair the fund in the first place. The European Commission proposes the laws. Each country gets to nominate a commissioner. The European Commission president assigns them a portfolio. Many of these are stable, but they are also somewhat fluid, depending on the college. It is up to the president to allocate the portfolios. For example, the ENP portfolio has been moved around. Until 2009, one person was in charge of External Relations and Neighborhood Policy. Now, the Neighborhood Policy portfolio has been given to the person in charge of enlargement. Finally, Juncker appointed a new "security commissioner" post, and gave it to the UK. Solana is the leading Antichrist candidate in world history. Someone needs to chair the new European Defence Fund. This would be the perfect job for him, since the travel demands wouldn't be as bad as High Representative, and its right up his alley, due to his preoccupation with defense spending and capability development. The next European Commission could easily make a defence commissioner post, as some have suggested. The EU High Representative is already overworked, so a defence commissioner post makes sense, according to EU Parliament member Urmas Paet. Solana is old. But he is still very interested in politics, and has an active twitter. He still gives speeches and writes articles. He even advised European Parliament last year, and wrote an 80 page document for them on European Defence Union. Even though Solana turns 75 in a few days, he is still younger than Bernie Sanders, who was running for U.S. President, which could last up to 8 years. Age is never an obstacle for God, as the story of Abraham and Sarah shows. A few interesting things are coming up. July 13 - Germany and France hold a bilateral meeting on increasing defense cooperation. This intends to go even further than what the EU has already agreed to. Early 2018 - Parliament and Council will have ratified European Defence Fund into law. A leadership structure will need to be agreed upon by then. Whatever happens in 2019, if Solana is destined to get a job, it will be very politically feasible, as both the HR position and a possible new commission post will open up. God is still active in this, since he is apparently revealing 666 connections to us, as he did in the past. Short time or long, God's word will come to pass. I can't wait for the time when everything is "up and running again" and we "know" the theory is true. Against all odds, God is bringing about some things that are very unlikely from a human standpoint. Praise and glory to God. Jesus is coming soon. Let us wait eagerly and be ready. thank you david. i'm still watching with you...and with increasing interest. thanks andre'! hopefully more things will develop in the coming months. may our Lord Jesus return quickly!